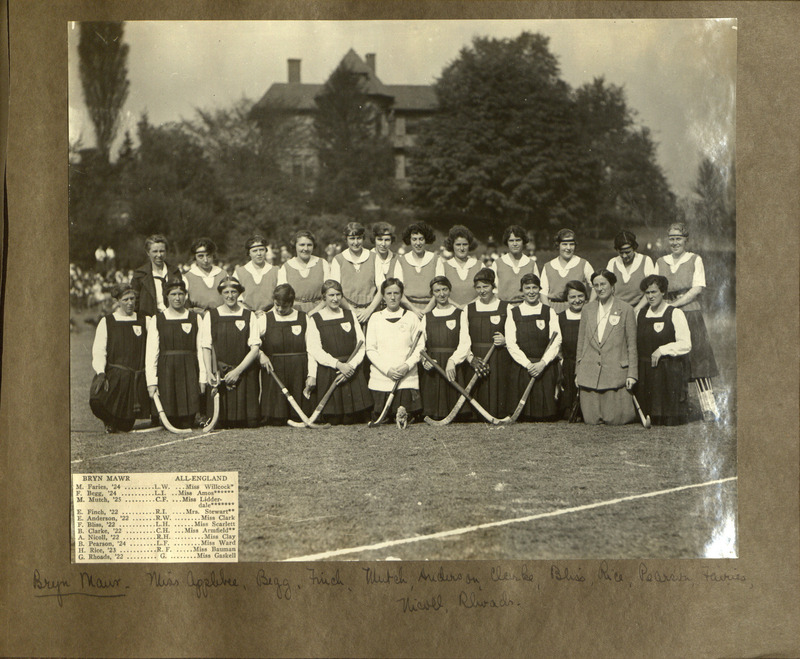 The Bryn Mawr College Varsity team with the All-England team, whom they played in 1919. Applebee created as many opportunities as possible for students to participate in athletics. She introduced new sports such as lacrosse, fencing, and water polo, as well as instituting the system where each class had four or five field hockey, basketball, and water polo teams, all of which she coached. The majority of students seem to have approved heartily of Applebee's leadership because of her encouragement of competition. Applebee also encouraged extramural competition: she organized regular field hockey matches between Bryn Mawr's Varsity and teams from country clubs in the Philadelphia area. The Varsity team occasionally played games against opponents from farther afield, including New York City, Baltimore, Goucher College, and even the All-England team in 1919. Applebee's consistent encouragement of extramural competition throughout her time as Director is notable since as the 1920s wore on, her colleagues in physical education increasingly disapproved of and resisted any sort of extramural competition for girls and women2. 1. C. D., '05. "The Athletic Association." The Lantern, no. 15, Spring 1906, pp. 80. 2. Gerber, Ellen W. “The Controlled Development of Collegiate Sport for Women, 1923-1936.” Journal of Sport History 2.1 (1972), pp. 1–28. Lee, Mabel. “The Case For and Against Intercollegiate Athletics for Women and the Situation as It Stands Today.” American Physical Education Review 29.January (1924), pp. 13–19. --. “The Case For and Against Intercollegiate Athletics for Women and the Situation Since 1923.” Research Quarterly for Exercise and Sport 2.May (1931), pp. 93–127. Trilling, Blanche M. “The Playtime of a Million Girls or an Olympic Victory - Which?” The Nation’s Schools 6.August (1929): 69–73. Wayman, Agnes. “Women’s Athletics: All Uses - No Abuses.” American Physical Education Review, vol. 24, November (1924): 517.